1.Cook corn in boiling water for 5 minutes. Drain, cool and cut corn into 2.5cm-thick rounds. 2.To make the pineapple salsa: place pineapple, spring onion, capsicum, chilli and lemon juice in a bowl. Stir to combine. 3.Combine turmeric, curry powder and oil in a small bowl. Place fish on a plate and brush both sides with the turmeric mixture. 4.Heat a barbecue hotplate or frying pan on medium-high heat. Cook the fish, skin-side down, for approximately 3 minutes. Turn and cook the fish for a further 3 minutes or until browned and just cooked through. Transfer to a plate and cover with foil to keep warm. 5.Add corn and lemon quarters to the barbecue hotplate. Cook for 3 minutes or until golden and just starting to char. Place steamed rice on serving plates. 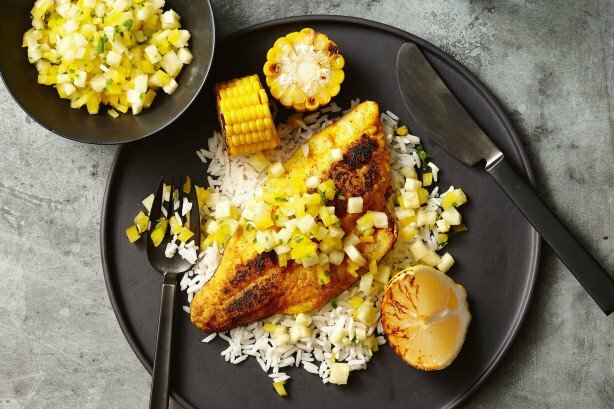 Top with fish, pineapple salsa and serve with corn and charred lemons.